To know 'Who we are' you need to know where we were. 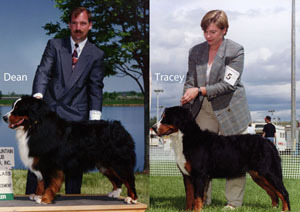 That story started with Tracey and her family many years ago, when they decided to become dog breeders. German Shepherds to be exact. 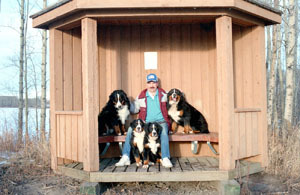 Since that time the kennel changed to Bernese Mountain Dogs (thus the name) and together we have accumulated many years of experience in the raising, breeding, training, and feeding of dogs. In the mid '90's we started to question if our feeding practices were affecting the health of the dogs. We looked around at several of the commercial foods from the 'high quality' to 'bargain brands'. All seemed to satisfy energy needs to varying degrees. 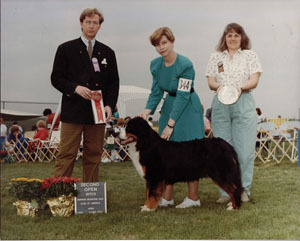 The problem was the overall health of the dogs did not improve. Some of the foods lead to coat problems or loose stools... very loose (and not always the 'bargain brands'). We still had plaque building up on the teeth. In general they did not meet our expectation. Then it occurred to us that maybe the dog food processing had surpassed the genetic capabilities of dogs to process it. Then Tracey, in about 1997, investigated a more natural diet. She read everything. Talked to everyone. From that investigation we started to process our own dog food. Starting small (in a food processor) Tracey ground for hours. The results though were dramatic. The dental hygiene improved. The coats improved. The litter sizes and health improved. The stools improved. In general our expectations were met. Feeding 10 dogs a natural diet from a food processor was consuming our lives. Not to mention the 3 juicers we burned up in the first month. Always being the handy guy, and frustrated at the television I was missing due to the static from the food processor, I determined a new solution was needed. It turned out to be an old manual grinder attached to an electric motor. A whole 1/2 horse power unit. That improved things a lot. Now it only took 5 - 6 hrs to grind 3 weeks of food instead of 2 hrs every night. This worked well until we found a supplier of ground chicken. A fox farmer who was going out of business. He had his equipment up for sale. An industrial grinder (40 - 60 Hp) a walk-in freezer, the works. We needed the chicken supply, that was for sure. But wasn't this over doing it? To make this long story a little shorter, suffice to say that we bought the equipment. Built a building. Set it all up. Started grinding producing food. That was April 1, 2000. Years later and many additions, we now have two locations in western Canada and distribution in Ontario. We will produce more food than we ever thought possible. Thanks to many customers advocating our idea we now are a young and growing business with a lot of potential. Come join us at our new location and see the work we do... helping to create a healthier life for our pets.